We are Looking to Start Wildlife Fence Repair in 2019 Please email officers@snoqualmievalleyelk.org if you are interested. We are looking for one last push to finish working on the wildlife fence in 2018. We are hoping we will get enough volunteers on this date! Please contact Scott Phelps or reply to administrators link on our website that you are interested. Thanks! We are looking for volunteers do do our spring elk census. We start March 13th 2017. If you are available please contact Harold through research@snoqualmievalleyelk.org. Looking to get outdoors and do some hiking? Need to start getting in shape for hunting season? Want to help the elk and possibly prevent injuries or worse in car accidents on I-90? 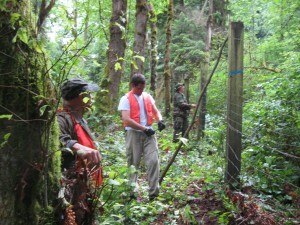 We are looking for volunteers to help work on the wildlife fence along Interstate 90 between North Bend and Snoqualmie. Work is mostly on Saturday mornings but there are a few opportunities during the week. We will egin working in April. If you're interested please email Scott Phelps at scott81965@gmail.com. He will put you on his invite list and let you know which days they will be working. If your available you can sign up. Come on out and pitch in!